Boise State star running back Ian Johnson expects to be in the starting lineup Sunday against East Carolina. Ian Johnson's week in Hawaii got off to a slippery start. The junior running back rolled his ankle during Boise State's first practice on Tuesday and hasn't played at full speed since. He plans to give it a go in practice this morning. "The grass was a little wet and I rolled it up a little bit," Johnson said. "I ran around a little (yesterday) and it felt good. I'm going to go at it full-bore (today)." He expects to be in the starting lineup Sunday when the Broncos face East Carolina in the Sheraton Hawaii Bowl at Aloha Stadium at 3 p.m. The game could be his last in a Broncos uniform. After becoming the third back in school history to have consecutive 1,000-yard seasons, Johnson is open to skipping his senior season and entering the NFL Draft. "It all comes back to what grade the NFL submits back to me," Johnson said. "From there I'll make the decision that's best for me, my future and my family." This year's bowl doesn't have the same magnitude as the Fiesta Bowl, but the Broncos have actually been much busier in the days leading up to the game. "This year is more of a structured environment," Johnson said. "Last year was more just go around and do whatever you want. There's a lot more events." Things aren't quite as hostile the second time around for Kapono Rawlins-Crivello. 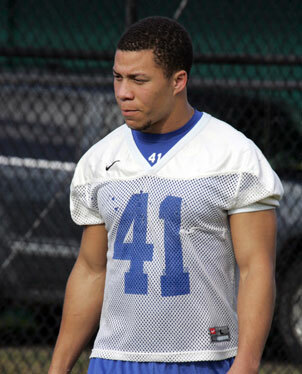 Ever since the '06 Kamehameha graduate decided to play football for Boise State, he eagerly anticipated returning home. He knew he would be labeled an enemy, possibly even a traitor, for playing football at Hawaii's biggest threat in the Western Athletic Conference. But things were taken to a whole new level when Rawlins-Crivello made his first trip back last month for Boise State's season-ending showdown with the Warriors. Both teams were undefeated in the conference and playing not only for a WAC championship, but a possible BCS bowl berth. With so much at stake, it wasn't quite the homecoming he had envisioned. "It was such a big game for everybody here," Rawlins-Crivello said. "I got (grief) from a lot of people, but I can understand. The people here have a lot of pride in the University of Hawaii." A month later, Rawlins-Crivello is back as the Broncos play their second game in a row at Aloha Stadium. The atmosphere isn't nearly as stressful and the redshirt freshman defensive end plans to enjoy the game a little more. Instead of lining up against Hawaii, Boise State faces East Carolina, giving Rawlins-Crivello the chance to be one of just two Hawaii-born players on the field. "I'm more excited now because I'm the local boy in the game," Rawlins-Crivello said. "I see it as I not only get to represent Boise State, but Hawaii, too." His journey to the collegiate level didn't begin until the eighth grade. Rawlins-Crivello was born and raised on Molokai, where there weren't any organized football leagues. He would hear about his older cousin playing football at Kamehameha and watched games on television, but never had a chance to play in a real one. "The closest I got to anything was throwing the ball around with my dad," he said. In order to pursue his dreams, he moved to Oahu for the seventh grade and attended Kamehameha, where he began his football career the next year. He was a second-team All-ILH selection his senior season and did enough to get a scholarship offer from Boise State. As a redshirt last season, the only road trip he was allowed on was the one to Arizona for the Fiesta Bowl. He didn't play in the game, but got to experience first hand the perks of being on one of college football's biggest stages. "The experience there was unexplainable," he said. "We were treated with such high class. It was interesting to see how much people put in to preparing for that game and attending to us." The spotlight isn't quite as bright, but the Hawaii Bowl still represents a chance to finish off what the Broncos set out to accomplish in August. "Our main goal this year was to make it to a bowl game and win it," Rawlins-Crivello said. "No matter what bowl game we ended up in, we were going to practice the same, prepare the same and give whatever team it was the best we had."